298 pages | 6 B/W Illus. Written by a psychologist who has worked with families and foster children for 11 years, Treating Families and Children in the Child Protective System is designed for therapists, social workers, family preservationists, court officers, attorneys, judges, and others caught up in the interplay of child protection. 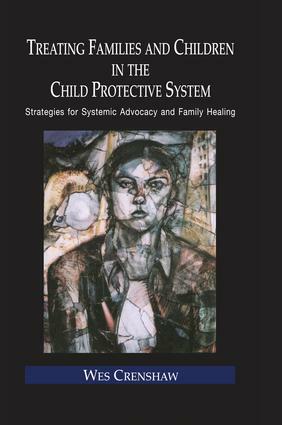 Using theory and compelling case studies, the author posits child abuse as an ultimate form of family injustice, requiring intervention at every level of the system. The author proposes a critically optimistic stance, approaching each case as a family-friend with practical and powerful tools to direct the overwhelming power of the system into a force for the restoration of family justice. Dr. Wes Crenshaw, Ph.D., is a licensed psychologist and holds board certification in Family Psychology from the American Board of Professional Psychology (ABPP). Dr. Crenshaw directs the Institute and has over 11 years of experience providing therapy to families and adults. He specializes in working with adolescents and young adults on issues of sexuality, interpersonal conflict, eating, oppositional behavior, substance abuse, and academic achievement. He is trained and experienced in conducting parenting and custody evaluations for the courts, and has a unique specialization in foster care and adoption therapies. He has published papers in numerous peer-reviewed journals and has served as a training consultant and supervisor for numerous agencies in Kansas, Colorado, and Virginia.